ID:1824 March 22, 2017 Countries:Global Pages:132 Ameri Research Inc.
Social media is being nerves of modern society and having revenue of 13 billion USD in 2016 and expected to grow at a CAGR of 21.29% till 2024. Rapid development in online media marketing, smart phone market and an increase in a number of users are major growth factors for social media market. Social media networking involves people having similar interests and thoughts share their ideas, views and personal status in social media platform. Major emerging social networking is Facebook, WhatsApp, Facebook Messenger, Twitter, YouTube, WeChat, Instagram, Snapchat, Skype, Viber and LinkedIn. The number of active users is increasing exponentially day by day. Facebook alone reaching 2000 million active users at the top most position. Increased networking between the people to be more socialized is boosting the market. Global Social Media market can be classified in two ways depending on the type of users as Consumer Social Media and Enterprise Social Media. Having a large margin, consumer social media is expected to grow rapidly with a CAGR of 14% in the forecast period. Consumer social media is one of the major platforms for advertising and promotion. In recent years most of the companies are moving towards online marketing through social media marketing. Facebook is emerging as world’s top media market with respect to a number of users, followed by WhatsApp with more than 1000 million users. Many of other social media forums are giving tough competition to existing companies, like Instagram is expected to have more than 700 million users by the end of 2017. Twitter is shining as the fastest news and personal status update as a public media enterprise, expected to grow at a CAGR of 8% in forecast period with nearly 400 million users in 2017. Enterprise social media market is expected to grow at a CAGR of 20.03 by 2024. Companies are adopting Enterprise social media systems to achieve maximum benefits of the organization. Social media market is one of the core emerging fields in technological innovation. Each individual organization has their own methods to execute, a need for continuous improvised technology is very high. The Arduino is a device which is used in tweeting is one of the major development. RFID Tags & Transponders, Geomagnetic Sensors in Mobile Devices, Optical Pattern Recognition and Natural Language Processing are some of the latest technical innovations in the field of social media. The major players in social media market are Facebook, WhatsApp, Facebook Messenger, Twitter, YouTube, WeChat, Instagram, Snapchat, Skype, Viber, LinkedIn, Google+, and Meetup. There are nearly 900 social media platforms which are in the race. Companies are giving more flexible and personalized features to increase the number of users. Major companies are acquiring small competitors. Facebook acquired WhatsApp for 19 billion USD to sustain the growth in the market. More than 40 deals have occurred in 2016 in social media M&A. Search keywords for any blog, companies, or to the advertisement through social media is one of the major growth driving factor. The increase in a number of smartphone users is another driving factor. Problems of addiction to social networks, security issues, and awareness towards health problems in a long usage may restrain the growth to some extent. The growth of social media market is tremendous in the forecast period, developing countries and developed countries are expected to show positive numbers. This report provides factors about current market trends, category, technologies, and market drivers and M&A. Provides market projections for the upcoming years including the present technology and trends. Defining market size from 2013 to 2015. 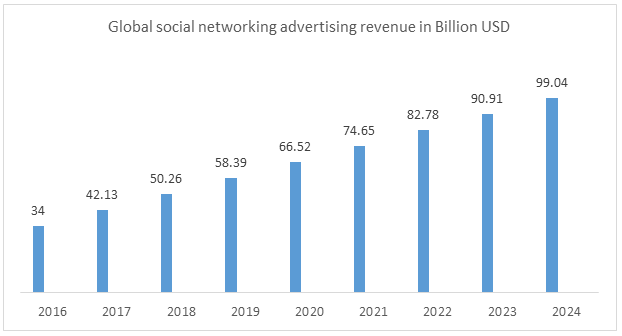 Social media is being nerves of modern society and having revenue of 13 billion USD in 2016 and expected to grow at a CAGR of 21.29% till 2024. Global Social Media market can be classified in two ways depending on the type of users as Consumer Social Media and Enterprise Social Media. Facebook is emerging as world’s top media market with respect to a number of users, followed by WhatsApp with more than 1000 million users. The Arduino is a device which is used in tweeting is one of the major development. RFID Tags & Transponders, Geomagnetic Sensors in Mobile Devices, Optical Pattern Recognition and Natural Language Processing are some of the latest technical innovations in the field of social media. The major players in social media market are Facebook, WhatsApp, Facebook Messenger, Twitter, YouTube, WeChat, Instagram, Snapchat, Skype, Viber, LinkedIn, Google+, and Meetup. There are nearly 900 social media platforms which are in the race.